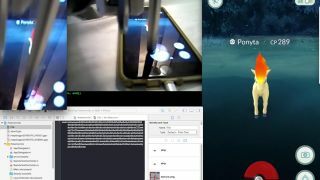 One day the world will be tired of Pokémon Go, but it doesn't look like that day is going to arrive anytime soon - and it turns out people are now building robots to help them conquer the mobile gaming hit. Matt Vitelli used a Novint Falcon controller, a stylus and some lines of code for his "weekend project" and even added some GPS hacks for good measure (because his clever droid can't actually move anywhere). "Eventually I'd like to implement some computer vision techniques to automatically detect Pokémon, click on them, and successfully capture them all autonomously," writes Vitelli. Unfortunately the bot is in breach of the game's terms of service so you risk a ban if you try and make your own. The DIY system doesn't look particularly accurate but we commend Vitelli for his ingenuity. If you are needing some help with reaching a respectable level on Pokémon Go then we also recommend this drone or this iPhone case that you 3D print yourself.